Summary: One of the most anticipated debut novels of 2014, Cutting Teeth takes place one late-summer weekend as a group of thirty-something couples gather at a shabby beach house on Long Island, their young children in tow. 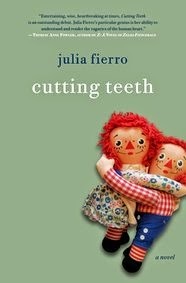 I think the novel CUTTING TEETH by Julia Fierro is on just about every recommended summer reading list I've seen. It was even an Oprah.com Book of the Week! I can't help but agree. This book is extremely well written, plus it's smart and insightful. It's also funny -- painfully so at times; and I think it will resonate with many readers, especially those who are parents. CUTTING TEETH is about a group of Brooklyn couples, who with young children, head to Long Island for a summer weekend. The group consists of five couples (four of the moms and one dad are all members of the same play group), and each family is facing a different issue. Nicole, the hostess suffers from OCD (among other things) and turns to prescription drugs to keep her issues hidden. While Rip, the stay-at-home dad, wants another child but his career driven wife isn't on the same page. Allie is having thoughts of leaving her pregnant wife and kids to pursue her dream of creating art. And Tiffany is insecure with whether she belongs in this upper-middle class group, and rather than keeping to herself, she flirts and flaunts her killer body. Finally, there's Leigh, a blue-blood who is close to being broke and who holds a dangerous secret that could ruin her family's lives. Needless to say, each person is a bit of a mess and has their fair share of baggage. CUTTING TEETH is Ms. Fierro's debut novel and what a fantastic start. It's almost hard to believe this is her first book because the writing is so polished and the dialogue is so sharp. In addition, CUTTING TEETH delves into so many thought-provoking issues including mental illness, marriage, parenting, insecurities, class structure, jealousy and love. By creating these complex characters, Ms. Fierro features the difficulties that many parents face (albeit in a more entertaining way); and that we, as readers, aren't alone in our daily struggles to make life perfect! The story is told through a variety of characters' eyes and I loved this narrative style. While I didn't always "love" the characters, I found their individual stories to be extremely interesting... and often times funny. By hearing different characters' version of events, I was able to better understand them and even feel some compassion because I knew what was truly going on inside their minds. CUTTING TEETH definitely has a little something for every reader. For those of you who appreciate strong writing and a literary flair, this novel definitely has both of those things. In addition, the characters are brought to life, foibles and all; and you can't help but be reminded of individuals you know (or perhaps even yourself!) There is lots of drama and even some humor, and many relationship issues are presented which are worthy of some reflection. While I found that all of the characters had something to offer the reading in CUTTING TEETH, my absolute favorite was Leigh's Tibetan nanny Tenzin. In a house full of people with concerns only the young and the wealthy can have, Tenzin brought some common sense and perspective to the story -- she "grounded" it, if you will. She saw things in these characters that wasn't always obvious and her views on parenting were so wise. Of course, CUTTING TEETH would make an incredible discussion book! Fortunately there is a reading guide available with 17 questions; however, I'm not sure one is necessary to get your conversation started. I think I've given you a fairly decent idea of some of the discussion topics in this story, but some additional themes include depression, anxiety, secrets, lies, stay-at-home moms vs. working moms, stay-at-home dads, parenting styles, gender issues, marriage, friendships, ethical issues, and parent/child relationships. CUTTING TEETH was one of the most anticipated books of Summer 2014. Don't miss it! I'm glad you enjoyed this one. I thought I would, as I'm a mother about the same age as the characters and I have kids about the same age as those in the book. This does sound like a book that would make for a great discussion. I keep seeing this book pop up on blogs. It definitely sounds like an interesting read thanks to your review!